Alhamdulillah, I managed to finish off our Ramadhan wall – and just in time! This year, I really wasn’t sure which direction to take or whether to even TO try take a direction (hey, school’s on – it’s busy! ), and then as usual guidance came through the form of several perfect posts on the Quran, and voila – my theme for this year has been decided! I really am not very creative, so I love getting these ideas from everywhere as it saves me from trying in vain to think up innovative things from scratch – in many cases, it’s just a matter of pressing print and cutting! I’m sharing here in case it helps all of you mums who also don’t think they are up for it – seriously, if I can do it, so can you. I have tried incorporating bits of many of the ideas – all of which I have shared in recent days. The hadith about the homes in which the Quran is recited shining bright for the angels to see if the main focus (thank you for sharing Zakira Shyrose Jaffer Dhalla! ), and around it there are stars which Inshallah we all will fill with ayahs from the Quran that we come across, like and want to focus on. 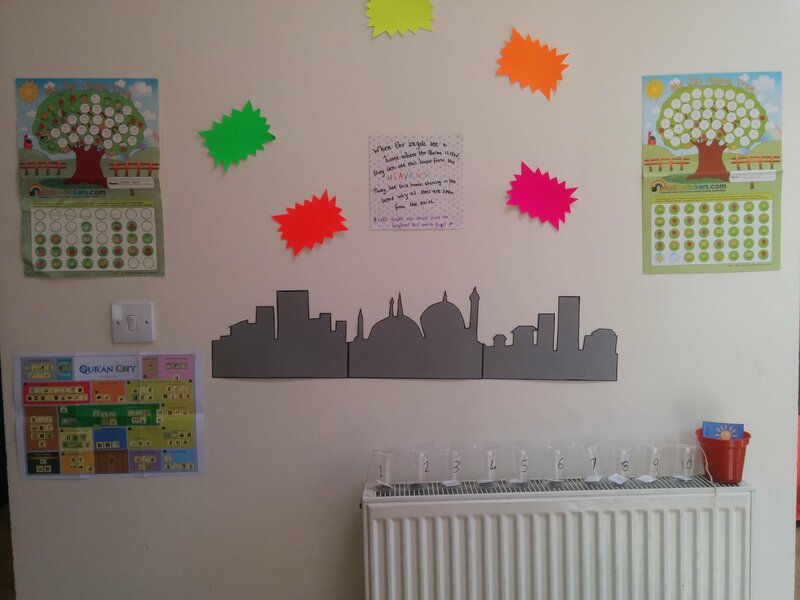 Quran City (Q-City) has been a focus of study for us for the last few months and so a poster of the city is up there are a reminder – thank you MUCH, QFatima! On the right hand side is the easiest countdown ever (I did say I wasn’t creative so easy always works with me!) – it’s from last year (reusable!) and it is just 10 clear plastic glasses strung together with numbers written on them! In it are Quran quiz questions from Islam From the Start and some money for them to give sadqa. I toyed with the idea of sweets to fill up the glasses and make it more colourful, but to be very honest, my kids haven’t really gone for that in previous years so decided to just leave it at that. In the jar next to it are the Quran word cards from the 30 Day Ramadan Activity also shared earlier (parenthoodmuslimstyle.com). I am not going to have the children stick it on a chart after they look the word up in the Quran, but stick it in their Ramadhan scrapbook instead along with their thoughts/notes. Lastly, the Juz Umma sticker charts will help us on the memorisation side of things – this year we will just be focussing on refreshing and retaining the suras we have learnt thus far – and this sticker chart is a great way to make it visual and fun. P.S. Here is another idea for a Quran wall. 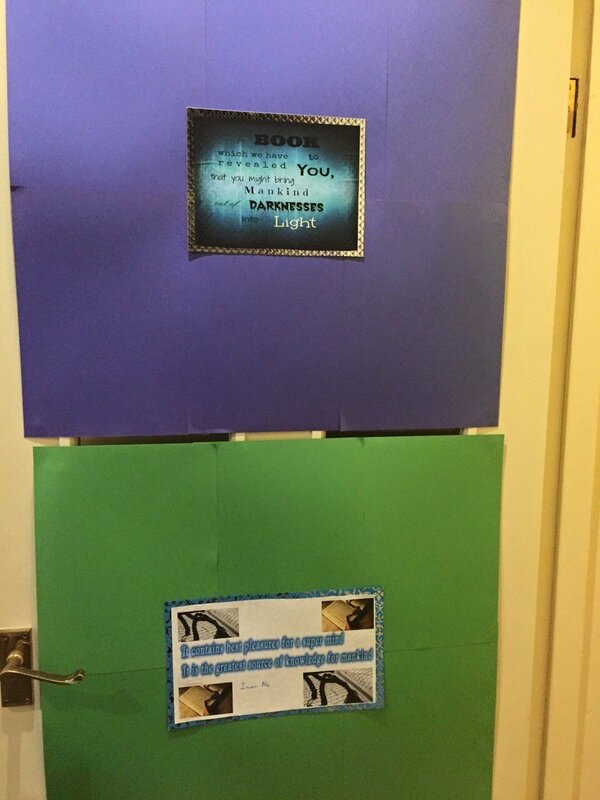 This idea was sent in by a mum, and once again allows the children to focus on the deeper understanding of the Quran.